What Ina Garten is known for—on her Food Network show and in her three previous bestselling books—is adding a special twist to familiar dishes, while also streamlining the recipes so you spend less time in the kitchen but still emerge with perfection. And that's exactly what she offers in Barefoot in Paris. Ina's kir royale includes the unique addition of raspberry liqueur—a refreshing alternative to the traditional crème de cassis. Her vichyssoise is brightened with the addition of zucchini, and her chocolate mousse is deeply flavored with the essence of orange. All of these dishes are true to their Parisian roots, but all offer something special—and are thoroughly delicious, completely accessible, and the perfect fare for friends and family. 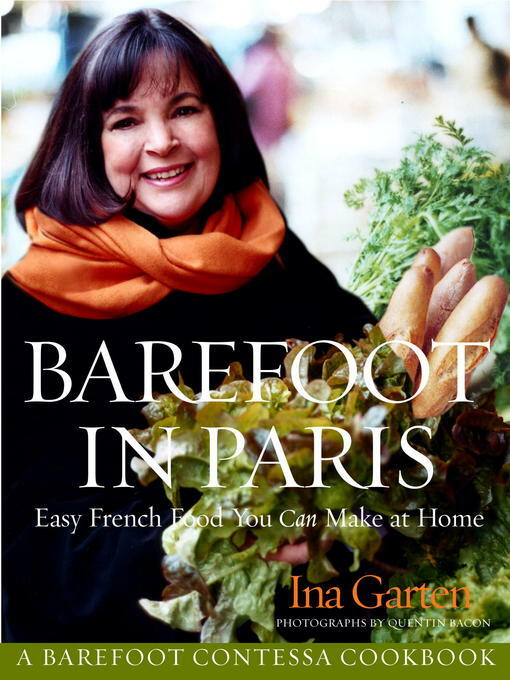 Barefoot in Paris is suffused with Ina's love of the city, of the bustling outdoor markets and alluring little shops, of the bakeries and fromageries and charcuteries—of the wonderful celebration of food that you find on every street corner, in every neighborhood. So take a trip to Paris with the perfect guide—the Barefoot Contessa herself—in her most personal book yet.